Hey Congratulations, the excitement is about to begin – planning for the biggest, most important day of your lives! This day is YOURS and, whatever you are told, whatever anyone suggests to you or wants you to do, your Wedding Day should be the way you want it to be. The organisation of the day is also something that you should only allow people that you know, trust and are comfortable with to handle. That’s why we don’t encourage people to book our services online before we have all met in person. 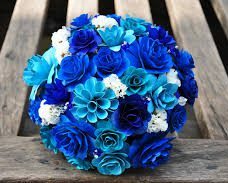 Sometimes, due to personal circumstances, this is not possible, but we much prefer to meet you beforehand for an informal chat over coffee to get to know you as a couple and your dreams and expectations; it also gives you a chance to meet us and decide if we are the people you believe can handle your big day and reflect your dreams and wishes. Most importantly we not try to sell to you – we will listen to you to discover what you actually want. We will be the ones to handle the stress and anxiety associated with planning such a big and important event so you can relax and enjoy the day. We plan the day beforehand like a military operation, then we make a theatrical fantasy on the day. We will help you prepare the legal requirements for your marriage and will take it through to conclusion by organising the registration of your marriage with the NSO. 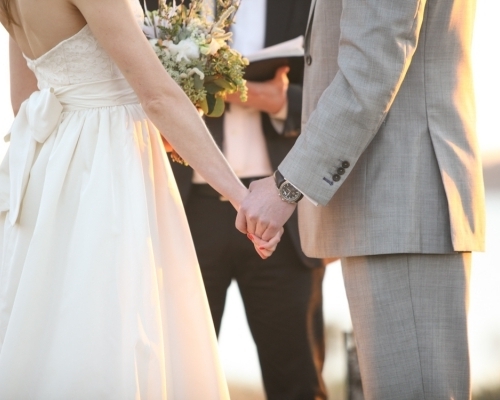 We can organise both full church weddings with a Catholic Mass or, where one of the parties may not be allowed to be married in a church, we can arrange a legal wedding at the same venue as the reception with many of the customs used in the formal Catholic wedding. Although this is our starter package, all couples that have chosen this option would agree that it was a beautiful and memorable wedding, enjoyed by all who attended. As well as the items listed below it includes our full coordination and planning of the day with you before the actual date. We can advise you on the legal requirements and, where your attendance is not required, we can actually obtain the necessary paperwork for you. 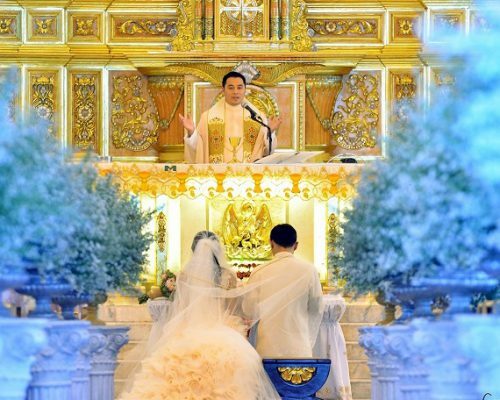 We will also advise you on all the legal aspects of a wedding in the Philippines. “Budget” does not mean basic; your day will be full of all the reverence, magic and fantasy that you would wish for on your special day. 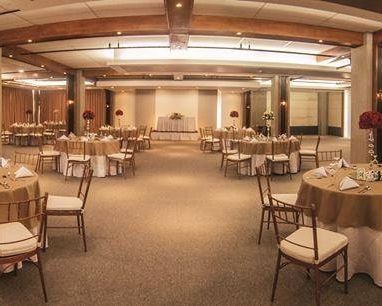 The venue for this package is in the Grand Ballroom of The Crowne Garden Hotel which is located close to the centre of Cebu. Special food buffet for 100 guests with waiter service for the Bridal Couple and the Presidential Table. One round of soft drinks for the guests. Overnight accommodation for the couple in the Honeymoon Suite, including breakfast and a fruit basket. Free use of an additional room on the day for the entourage to dress and make up. 50 Giveaways with Gift Tags. A (5) Five layers wedding cake decorated in your motif colours. 1 Bottle of Sparkling wine for the bridal toasting. Chair Back Ribbon to match your colour motif. Use of the sound system with mood music and love songs during the meal. Barongs for The Groom, The Best Man, 4 Groomsmen, 2 Fathers and 3 Male Bearers. Unlimited still shot saved on DVD. Photographic coverage from the Bride’s make up, ceremony to the end of the reception. 108 print out pictures in 4R size. Bouquets for the Bride, Maid of honour, 5 Bridesmaids and 3 Flower Girls. 30 Corsages (for the Groom, entourage and sponsors). Aisle stands for the reception and church if applicable. Floral centrepieces for the Bridal, Presidential and Buffet tables plus 8-10 guest tables. Hair Styling & Make-up for the Bride. Traditional Hair & make-up for 2 mothers. Full stress-free “on the day” coordination with 4-6 professionals. Professional Emcee for the reception. Registration of your marriage with the NSO ( if applicable). Special food buffet set up for 100 guests with waiter service for the Bridal Couple and the Presidential Table. On round of soft drinks for the guest. Use of venue for 4 hours. Overnight stay in a Deluxe Room with breakfast for two ( 2 ) persons. Free use of Public Address System & Mood Music. 50 pcs. Hand-made, personalized wedding invitations of your chosen style. A 4 layer fondant wedding cake decorated in your motif colours..
A pair of white doves in a decorated cage. Barongs for the Best Man, 4 Groomsmen, 2 Fathers and 3 Male Bearers. Mannequin for photos of the gown. FREE bridal accessories such as; veil, cord, arras ( 13 coins ), decorated candle and bible. 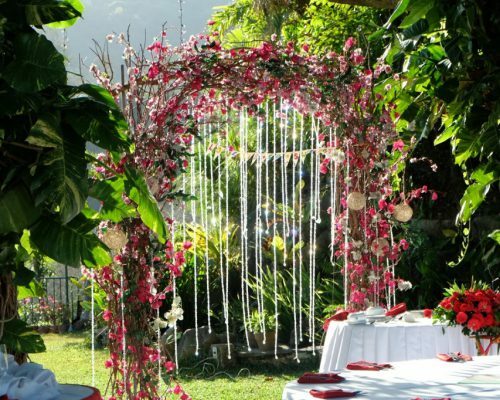 A choice of Gazebo or Arch decorated with your colour motif and accent. Licensed Celebrant to officiate your wedding ceremony. Full stress-free “on the day” coordination with 4 professionals. Professional Emcee for stylish & fun programme for the reception. Registration of your marriage with the NSO ( if required ). Special food buffet and Table set up for 100 guests with waiter service for the Bridal Couple and the Presidential Table. One round of soft drinks or iced tea for the guest. Free use of room for the entourage for hair and make-up preparations. One bottle of sparkling wine for the bridal toast. One (1) pc. Lechon ( Roasted whole pig). 50 pcs. Hand-made, personalized wedding invitations. 50 pcs. Hand decorated, personalized giveaways of your choice. A 3-4 layer fondant wedding cake decorated in your motif colours (design of your choice). 100 pcs. Chair ribbons to match your color motif. Magical effect during first dance (Party popper). Bridal car with floral arrangement) if applicable. Gowns for the maid of Honour and 4 Bridesmaids. Barongs for the Groom, the Best Man, 5 Groomsmen, 2 Fathers and 3 Male Bearers. Bouquets for the Maid of honour, Bridesmaids and 2 Mothers. Bouquets for the female Primary Sponsors. Wrist-lets style flower for the female Secondary Sponsors. Flower balls/Petal baskets and floral headbands for the flower girls. 2 candle stand (with can with decorated candle that match to your colour motif. Licensed Officiating Officer to conduct your wedding ceremony. 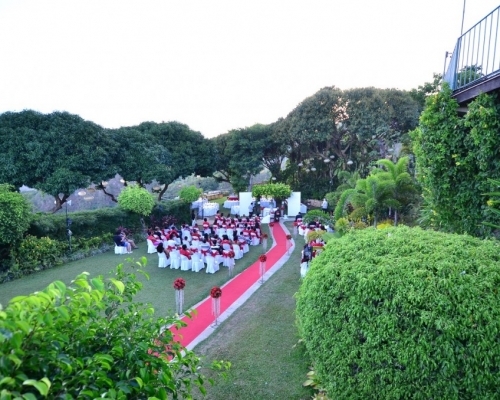 The Chateau de Busay – a beautiful venue where your wedding and the reception afterward will take place overlooking Cebu from high up in the hills west of the city. The Montebello Villa Hotel – a centrally located Villa Hotel with a beautiful poolside garden. Both venues have adequate back up facilities in case of bad weather on the day. One round of soft drinks for the guests and one bottle of wine for the toast. 1 (One) lechon ( whole roasted pig). Overnight stay for the couple with breakfast. Place cards for the Bridal and Presidential Tables. 100 pcs. Chair ribbons in your colour motif. 4 pcs Party Poppers for special effects during first dance. 50 hand-made, personalised wedding invitations of your choice of style. 50 hand decorated, personalised giveaways with gift tag of your choice. 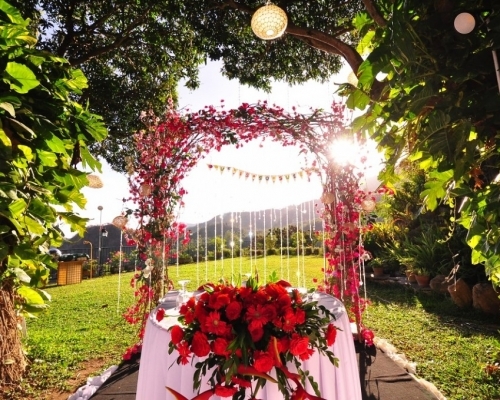 A choice of Gazebo or Arch decorated with your color motif and accent. Kiddie barongs for 3 Male Bearers. Food buffet for 100 guests with waiter service for the Bridal Couple and the Presidential Table. On round of soft drinks or iced tea for the guest. Use of Big Hotel Hotel Venue for 4 hours. Overnight stay in a Deluxe Room with breakfast for two ( 2). Use of Public Address System & Mood Music. 50 pcs. Hand-made, personalised wedding invitations of your chosen style. A 3 layer fondant wedding cake or 6 layer wedding cake ( icing) decorated in your motif colours.. This is one of our mid-range packages and as well as the items listed below it includes our full coordination and planning of the day with you before the actual date. We can advise you on the legal requirements and, where your attendance is not required, we can actually obtain the necessary paperwork for you. 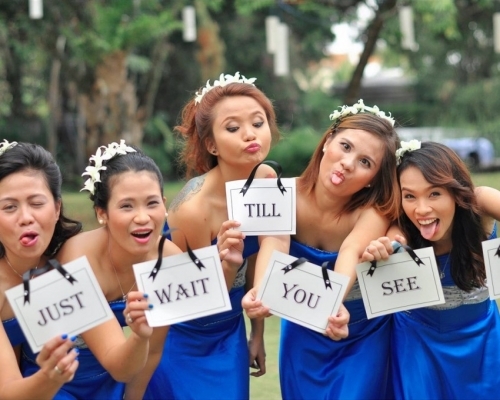 We will also advise you on all the legal aspects of a wedding in the Philippines. The venue for this package is the beautiful White Sands Beach Resort on Mactan Island, which was the venue we chose for our own wedding. 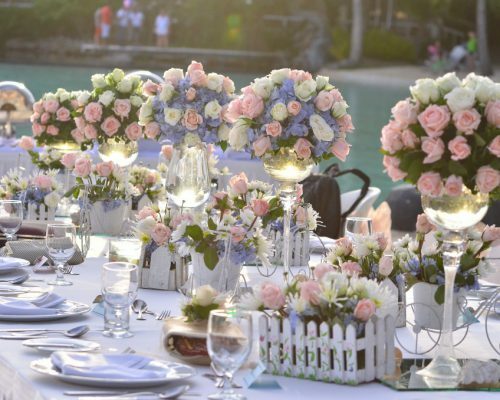 You have choice of 2 styles of wedding here, with Beach or Garden settings and the venue has adequate back up facilities in case of bad weather on the day. Special food buffet for 30 / 50/ 75/ 100 guests with waiter service for the Bridal Couple and the Presidential Table. One round of soft drinks OR iced tea for the guests. Three bottles of red wine for the toast to the Bride and Groom. Chair back tie in your colour motif. Three – tiered Wedding Cake ( fondant). Place card for the Bridal table and Presidential table. Ananharta “Signature Massage” for two people. 20/30/40/50 hand-made, personalised wedding invitations. 20/30/40/50 hand decorated, personalised giveaways with gift tag. 4 pcs. Party popper for special effect during first dance. Decorated fan or writ-lets type bouquet for unlimited Female Sponsors. Boutonnières/buttonholes for the Groom, Best Man, Grooms-men and Male Sponsors. Flower Balls OR Petal Baskets and floral headbands for the Flowers Girls. Unlimited floral centrepiece for guest tables. Bridal car with floral decoration and ” Just Married” plate. This is one of our premier packages and as well as the items listed below it includes our full coordination and planning of the day with before the actual date. We can advise you on the legal requirements and, where your attendance is not required, we can actually obtain the necessary paperwork for you. 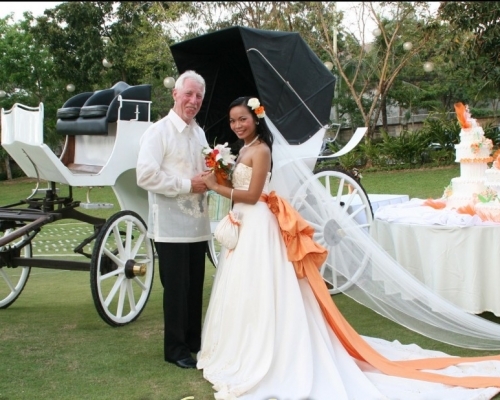 We will also advise you on all the legal aspects of a wedding in the Philippines. 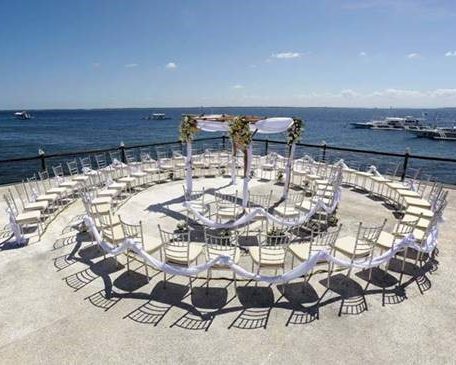 The venue for this package is the beautiful Plantation Bay Resort on Mactan Island. You have choice of 4 locations for your wedding here, with Beach or Garden settings and the venue has adequate back up facilities in case of bad weather on the day. International Food Buffet for 50,75 or 100 guests with waiter service for the Bridal Couple and the Presidential Table. One round of soft drinks for the guests and one bottle wine for the toast. A 3-r tier fondant wedding cake decorated in your motif color . Live entertainment by a saxophonist or violinist. Two (2) nights accommodation for the couple with breakfast in bed. 1 hour Aromatherapy Massage for the bride and groom. A candlelight dinner for 2 at any location within Plantation Bay, with serenaders, served by a private butler, including a romantic set up. 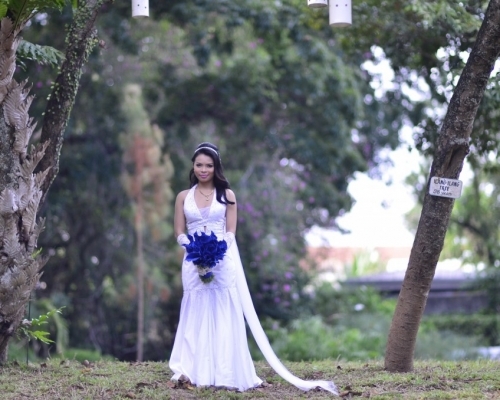 Use of the venue for your pre-nuptial shoot. A pair of doves in a decorated cage. Registration of your marriage with the NSO. We love making your wedding day more special and unforgettable experienced for your guest you will get a Fire Eater/Dancer Show at the reception. 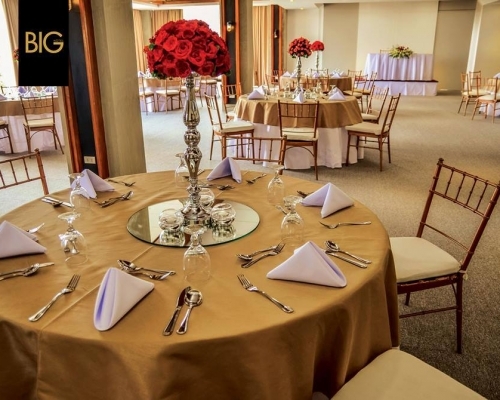 This package is perfect for you if you have your own preferred wedding venue. 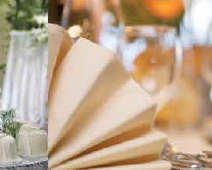 We will bring in everything else you need to make your Dream Wedding come turns to reality. Registration of your marriage with the NSO (if required). Special Food Buffet for 50 / 75/ 100 guests with waiter service for the Bridal Couple and the Presidential Table. Two ( 2) Overnight stays with breakfast in bed for the couple. One Lechon (whole roasted pig). A 5 tiered fondant wedding cake. We love making your wedding day more special and unforgettable experienced for your guest you will get a Fire Eater / Dancer Show at the reception. Special food buffet for 50 or 100 guests with waiter service for the Bridal Couple and the Presidential Table. One ( 1 ) bottle of Celebrus Sparkling wine for the toast to the Bride and Groom. Place card for the Bridal table and VIP table. 25 / 50 hand-made, personalised wedding invitations. Fireworks – from 10,000p up depending on the length of the display. Filipino Dance Entertainers – 20,000p for a 30 minute show. Transport for the guests – the price would depend on how many guests and the route to be taken. Photobooth – 7,500p unlimited use. Chocolate Fountain – depends on the consumables but around 5,000p. NOTE: All prices are correct as of 1st March 2016 but are subject to change at any time if our suppliers / venue increase or change the inclusions of their packages.